FIFA 19 has an interesting problem on its hands. As one of the most popular games in the world, it has a large fanbase that has gotten used to a certain style of play. That makes major changes, like the ones in this year's version of FIFA, jarring for certain segments of the population. Pop into any FIFA forum right now and you'll find a debate raging between fans who are pleased with what they consider to be an increase in realism, and players who hate the rebalanced pace and strategy. The latter in particular are zeroing in on three aspects in particular: shooting, pace, and defending. All three have been fairly substantially overhauled in one way or another. Shooting now includes a sometimes finicky timed finishing mechanic that can result in an incredible finish or a disastrous miss. A.I. 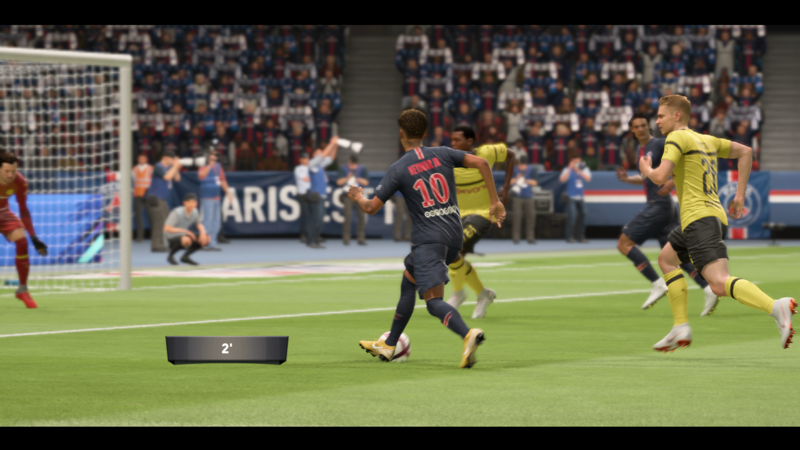 defending is improved to the degree that some players are claiming that they can set their controller down and let the CPU win for them after scoring a goal (I find this claim dubious). And breakaways are less common than before owing to a reduced emphasis on pure speed. But mostly, this year's version of FIFA just feels different. Detractors deride the "tank-like" way that players will turn, while supporters will talk about how much more in line it with the real sport. On Twitter I had one commenter tell me that "FIFA is catching up with Pro Evolution Soccer," which is high praise in video game soccer circles. Such comments, both positive and negative, make for a marked contrast from the past couple years. With the exception of maybe FIFA 16, which some laud as one of the most balanced in the series, pace has dominated for close to decade. The metagame has been defined by constant pressing, breakaway through balls to speedy strikers and wingers, and quickfire passing. Its critics have long referred to FIFA as arcade-y, preferring instead the smoother and smarter build-up of play found in PES. Nevertheless, there is a positive side to the old, "arcade-y" style of FIFA. EA's soccer sim has often been called an ambassador for the sport precisely because it's hinged so heavily on fast-paced action and accessibility. In America, where soccer is often derided as slow and boring, FIFA offers an alternative viewpoint. That in turn has made more than a few skeptical Americans, myself included, into diehard fans. So in making a good faith effort to try and make FIFA more realistic, EA is running up against years of precedent. And that kind of momentum is difficult to break. That's what makes it hard to separate legitimate criticism from fans saying, effectively, "It's different and now I hate it." Is the shooting actually that bad? Last year it felt like everyone scored the exact same way: the header from the far post, the screamer from distance, or the blistering shot off the side of the foot while pushing against a defender. This year it feels like it takes a little bit of skill to actually knock in a shot, and a few oddities aside, it's resulted in some tremendously exciting goals. Is the pace too slow? Actually, from my perspective, it looks much more like a real soccer game now. Even without the emphasis on pace, it feels much easier to spring players on the wing and get passes into the box. I've seen some chatter about this being "The Year of the Target Man," and it's true, hold-up play actually feels somewhat viable now. It almost makes me want to pull big Andy Carroll off the bench and let him stretch his magnificent, giraffe-like legs a bit (after which he would immediately pull a hammy or something, but I digress). Is defending too powerful? Last year centerbacks were so slow as to be borderline worthless. If you didn't manually defend with a CDM, you would be burned immediately by some pacey striker. I think defending could stand to be toned down ever so slightly in order to make dribbling more viable, but that's a tuning issue more than anything else. Over the weekend, as the general population was getting its feet wet with FIFA for the first time, I pinged a friend who once designed sports sims. He's in the mobile space these days, but he still plays ludicrous amount of FIFA. Last year he played all the way through the Team of the Season release and made it to Division 1. I asked him if he's enjoying FIFA 19. "I mostly do, with serious qualifications," he wrote back. "The balance is bad, but the fundamentals are great." I broadly agree with this sentiment. As is always the case with sports sims out of the gate, EA has some tuning to do. The changes are already on their way, though EA appears rightfully cautious after arguably upsetting the balance of FIFA 18 with last year's sweeping changes. Yesterday EA released the first FIFA 19 patch, which included fixes for the traits as well as a tie for Petr Cech. But even if there's still work to be done, I think the gameplay on the pitch is better than it's been in quite a while, and it's only apt to get better. There may be some growing pains as fans resist changes to the gameplay they know so well, but they are changes worth making. Check out our FIFA 19 guides for all the gameplay tips you need. We also have guides featuring the best young players and more! Tagged with Electronic Arts,	Feature,	PC,	PlayStation 4,	Sports,	Xbox One.